These are kind of like the lettuce wraps that I’ve had at various restaurants from P.F. Chang’s to Pho Grand, but better. Not so salty; not so sickly-sweet. The original recipe called for half beef and half tofu in the filling. I have no idea why—who needs the beef? I pared down the recipe quite a bit to match what I had on hand and forgot to add the 1 1/2 t. sesame oil from the original version (even though I had it). The recipe seems to be very forgiving. And delicious. Heat the canola oil in a large pan and briefly cook the ginger. Drain the tofu, press with dry paper towels, and cut into a small dice. Add to ginger and oil and cook for about 5 minutes over medium-high heat. Meanwhile, mix the remaining ingredients in a small bowl. Once the tofu has turned slightly golden, add the sauce and cook for a few more minutes until the sauce has mostly been absorbed into the tofu. 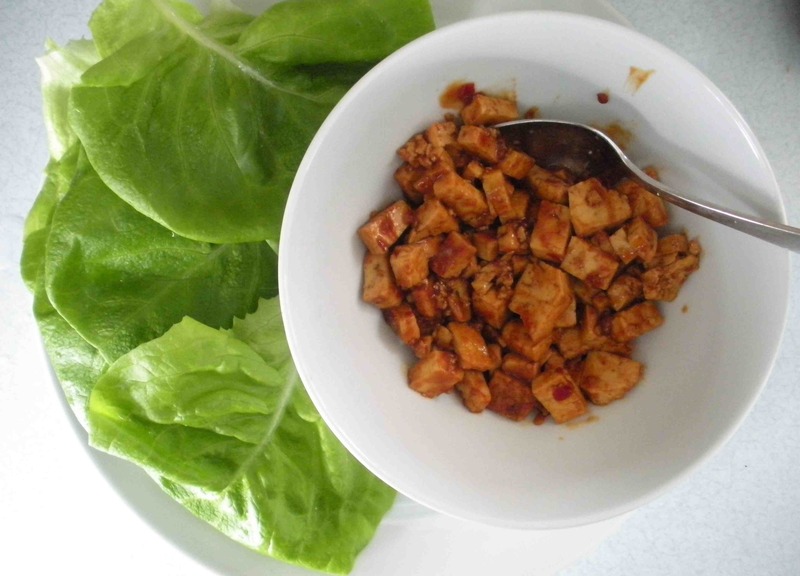 Serve with lettuce leaves for wrapping–I used hydroponic Bibb lettuce from Costco. The original recipe suggests all kinds of add-on toppings for the wraps: scallions, red peppers, and peanuts. I fished some peanuts out of a bag of Trader Joe’s trail mix and sprinkled those on top of my wraps because they weren’t quite crunchy enough. Classy. that’s why she tried to steal them from you! she subconsciously knew that she was going to need them in the near future.